Founded in 1997 by Cath Kenyon and Damien Byrne, Kaleida deliver dedicated IT solutions to their clients. We are experts in Microsoft .NET and SQL Server technologies and our recent clients include Renaker Build, Face For Business, Turner & Townsend and Sofology. "Their clients love them. So they stay with them"
Want to work on exciting projects, emerging technologies, with flexibility & working from home options? Excellent understanding of Object Orientated Programming, SOLID principles, Design Patterns and best practices. You will be responsible for delivering specified software to agreed quality and time-scales. If you're interested in this role, apply for this role or call us for a conversation. 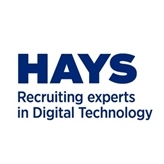 "Hays Specialist Recruitment Limited is working in partnership with Kaleida Ltd to manage the recruitment of this position." Kaleida work with clients across construction, insurance, leisure and financial sectors have all shared in the benefits of their work developing bespoke high-quality, secure software that streamlines their business, saves them time and makes them money.